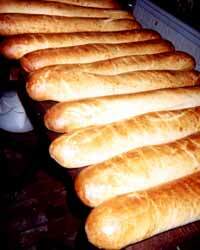 Welcome to the Sourdough Eatery web site. The Charming brick, vine covered Lenhart building, which dates back to the early 1900's, features a huge sunny European style courtyard, on an intricately layed brick patio. 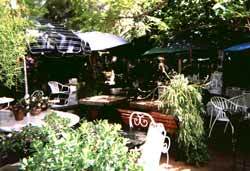 Hanging flowers, waterfalls, and outside seating for two hundred, mostly on wrought iron table and chair sets, between oak wine barrel, tile topped tables and some larger ”railroad wagons” for groups. 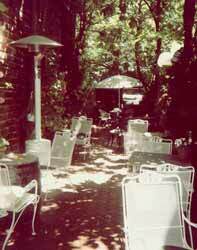 The lush garden patio is enjoyed year round, taking advantage of the climate that makes Silicon Valleys capital as famous as its high tech industry. Only the best and freshest ingredients are hand selected daily personally, by the owners. 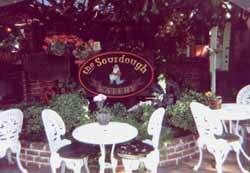 The Sourdough Eatery is family operated with secret recipes from the famous Brown Derby handed down directly from Barbara's chef father, who catered and cooked for the Hollywood stars. Old world know how dates back 100 years, from Michaels family in Europe. For more than two decades they have perfected the formula for the perfect sandwich shop. ©2002 Sourdough Eatery - web design by Impression Design.